Star Wars - Stormtrooper™ 3D Deco Light from 3DLightFX on Vimeo. Use the Force as you light up your room with 3D Deco Night Lights! 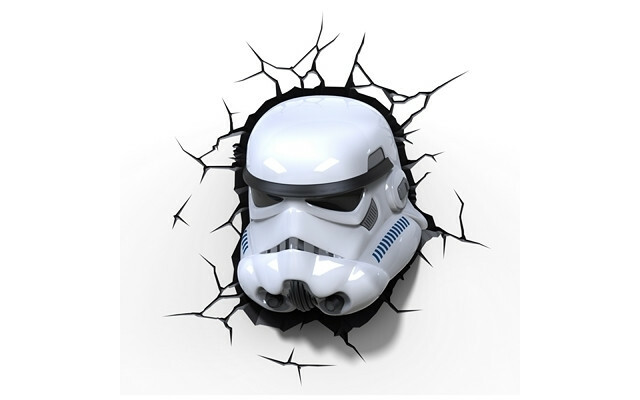 All lights include the 3D Crack sticker to give the appearance that the character has smashed through your wall. The soothing glow provides the necessary light for midnight changes, feedings, reassuring check-ins and, of course, to keep the ‘boogie monster’ at bay! All Lights are LED lite and battery operated and use 3 AA batteries sold separately. They have a convent ON/OFF switch, ideal for rooms with limited wall outlets. Don't forget to collect them all!